Terrorism has evolved as a preferred tactic for ideological extremists around the world, directly or indirectly affecting millions of people. Terrorists use many forms of unlawful violence or threats of violence to instill fear and coerce governments or societies to further a variety of political, social, criminal, economic, and religious ideologies. Terrorists threaten the national power, sovereignty, and interests of the United States and our allies. Terrorists organize and operate in a number of ways. Some operate within transnational networks, others operate as small independent groups, and others operate alone. CTS1: The Counterterrorism, WMD & Hybrid Threat SMARTbook sets out a comprehensive approach towards understanding the nature of domestic and international terrorism, state-sponsored terrorism, and the behaviors and characteristics of terrorists. It then explains the nature of hybrid threats, counterterrorism strategies, and counterterrorism tactics. The fundamentals of command and control, risk management, cyber threats, weapons of mass destruction, protection planning, consequence management, and workplace violence are all outlined and discussed in detail. 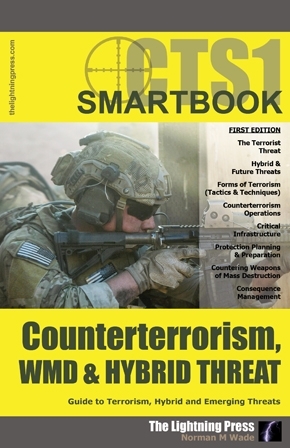 CTS1: The Counterterrorism, WMD & Hybrid Threat SMARTbook topics and chapters include: the terrorist threat (characteristics, goals & objectives, organization, state-sponsored, international, and domestic), hybrid and future threats (forces, organization, operations & tactics), forms of terrorism (tactics, techniques, & procedures), counterterrorism (strategy, fundamentals, command, planning, and operations) critical infrastructure (identifying weakenesses, risk management, and cyber threats), protection (warfighting function, supporting tasks, and planning), countering WMD (WMD weapons, planning, and execution), and consequence management (all hazards response, domestic, international and DoD-led CM). Download a free PDF sample and learn more at: CTS1: The Counterterrorism, WMD & Hybrid Threat SMARTbook (Guide to Terrorism, Hybrid and Emerging Threats).